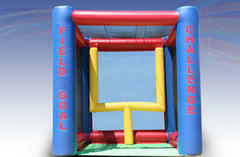 Who will be the all-star kicker at your next event? With The Field Goal Challenge, players test their ability by kicking a football off of a tee and trying to get it between the goal posts. Just like in the real game, it is accuracy that counts!